The baby chicks are not chicks anymore, their teenagers. In their awkward teenage chicken stage, they still look more like big chicks then they do hens. Their necks and legs are longer and larger feathers have grown in covering much of their downy fluff. 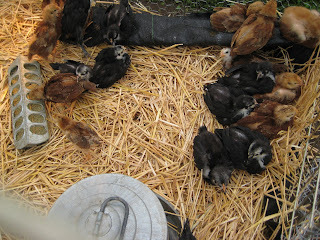 The cutest baby combs have appeared on their heads, like little pink tiaras, our little princess chicks. Because the chickens have grown so much, we had to move them from their temporary housing in the metal trough with the heat lamp, to another temporary coop in another greenhouse. Bill had an area reserved for the chicks, a metal cage that needed some chicken wire and hay. After doing a chicken coop remodel, we moved all 20 of the chicks in. They ran back and forth chasing after one another like tag. Bill and I stood over the coop watching them scurry for a little bit. How satisfying. 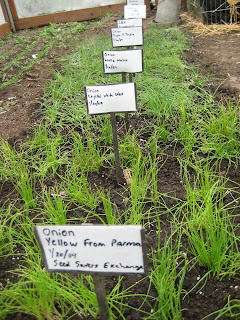 Winsome, another volunteer for the HerbFarm helped me plant three different types of leeks: Pandora, Tandora and one other that is escaping me right now. I also replanted some celery seedlings into larger pots. Parsley seedlings are just coming up and the baby greens are almost doubled in size since I saw them last. Also, learned about shot weed, a little leafy weed with white flowers. A weed no one likes but apparently is edible. More to come. At the HerbFarm garden a hundred different smells greet you when you walk inside. 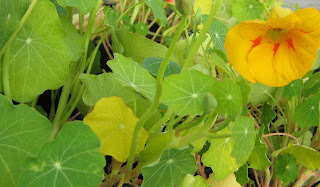 Rose geranium, pineapple sage, soil, peppery nasturtiums, fertilizer and several other light scents linger in the air. On the left, when you walk in, there is a large water trough, but instead of water, it's filled with 20 baby chicks, scratching and peeping under a heat lamp. Once the chicks have mostly grown, they'll be moved outside with the other egg layers. Until then, they’re pretty fun to pet and pick up and listen peep while your in the greenhouse. Most recently at the HerbFarm garden, we fed the woolly pigs a variety of bagels from the food bank's scraps, fed the chickens and collected eggs. 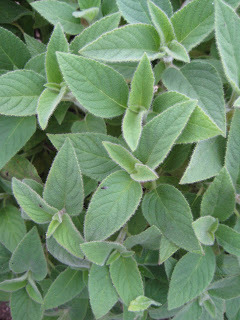 I then set to work on picking pineapple sage leaves for plate liners for the restaurant. 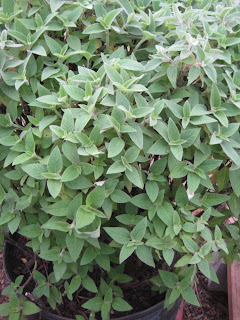 Pineapple sage smells so incredibly wonderful, sticky sweet candy-like smell- almost like Fruit Stripe Gum. And the leaves are sticky too, like double-sided tape. Perfect for holding down slippery plates. The tropical scent of the plant in the warm air in the greenhouse makes me feel like I'm in the rain forest zoo exhibit at Woodland Park and I’m just waiting for a dozen butterflies to come rushing out around me. 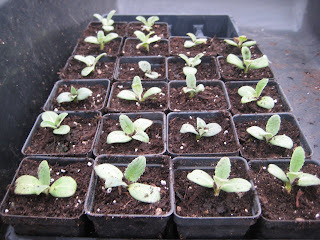 Afterwards, my next project was transplanting purple artichoke seedlings into bigger pots. Gardening is comforting and meditational, like coloring. Nothing like digging in soil and handling seedlings in a warm green house with peeping chicks in the background. Baby purple artichokes, Italian variety. One of three huge 3-foot tall pots of pineapple sage. Picnic, "a food and wine boutique" located on Phinney Ridge is a place you come back to. Only opened since October, I can imagine they already have neighborhood regulars coming in to purchase bottles of wine and stacks of freshly sliced salami and cheese for personal picnics in front of Netflicks, or to take to Woodland park or to enjoy on a bench at Greenlake. I recently stopped in for lunch to say hello to Jenny and Anson and introduce the place to my mom. We shared their beet salad with smokey Rogue blue cheese and hazelnuts, a pureed butternut squash soup and a thinly sliced salami and cheese sandwich with roasted red peppers. Everything was perfectly seasoned, made from scratch and healthy, not to mention delicious! We both had a cool glass of white wine from Washington made by a winemaker (name escapes me) who is specializing on growing vines from Spain in Eastern Washington and creating incredible wines. Picnic is a great place for lunch and if you are running late and need to make dinner, stop by and pick up a bottle of wine and dinner to go. 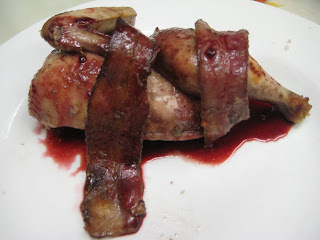 For example, they were offering braised short ribs and mash potatoes you re-heat at home. 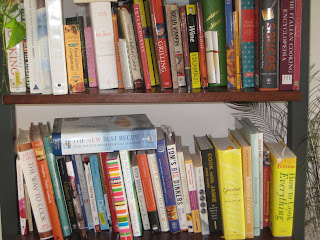 Or look online before you go, as they are always creating something new! At the Trellis restaurant, they have a two-hour garden salad; all the ingredients in the salad are harvested two hours before service begins, at the HerbFarm, the chefs clip the baby greens from the living plants just outside the kitchen doors. It's lovely to be offered a pair of scissors to clip baby greens with. After planting trees on Thursday and Friday before I left, Bill handed me a pair of scissors and said I could cut some greens for a salad. 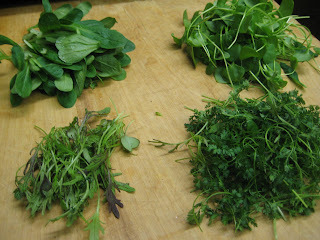 I clipped some chervil, baby mustard greens called Ruby Streak, miners lettuce and mache. I'll bring a camera to the garden soon and show you what they look like in the soil. Miners Lettuce, baby Ruby Streak Mustard Greens. The miners lettuce isn't as flavorful as the others, but it's fun to eat- it reminds me of the texture of watercress but not at all spicy. The red streak adds a gorgeous color to a salad and is both nutty, bittersweet and reminiscent of garden peas. 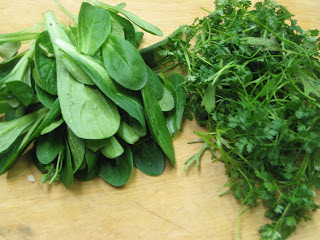 Here is Mache leaves next to Chervil. 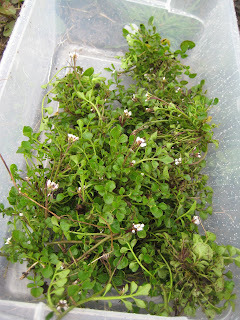 I love Chervil, it has a light licorice flavor that adds a hint of flavor like a little minty surprise. The mache is smooth and nutty. The chervil is really delicate and almost wilts under water, the mache is heartier and can really lift up a salad that looks flat. With greens this lovely, my salad was a mixture of all four lettuces, high quality extra virgin olive oil, a squeeze of lemon juice and sea salt, just lovely. 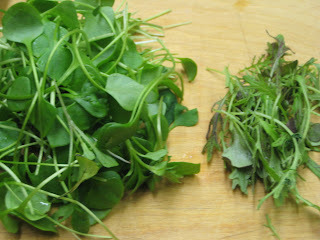 You can find mache at larger grocery stores near the arugula and herbs. It's likely the other greens will not be in the herb section, check out your closest farmers market or plant store for the other greens. Or better yet- grow some! My back is a little sore. Not in the same way one feels when they've had a great workout or from something as silly as pulling a muscle by giving someone very tall an awkward hug. I'm sore from digging holes for two oak and two hazelnut trees, each inoculated with black truffles. “Are you kidding! ?” is what I squealed when Bill, the head gardener at the HerbFarm said I’d be doing on Thursday. The trees are tiny and they won’t even produce a truffle likely for five years from now, but the idea that one could even buy a tree inoculated with black truffle spores is quite cool. They bought the trees online at TruffleTree.com , straight from Eugene, OR. Ron and Carrie Zimmerman currently own the HerbFarm and because the soil in the culinary garden doesn't have great drainage, Bill decided we should plant a couple trees in their yard, not too far from the culinary garden. "Each tree needs 250 pounds of lime." That was what Bill said when we got to the Zimmerman's house in Woodinville. For prime conditions for these trees, the Ph in the soil needed to be less acidic. The Ph scale goes from 0-14, with 7 being neutral and below 7 being acidic. I don't know exactly where Seattle or the Eastside's soil Ph is, but I do know that there was a variety of soil types depending on where we dug. Rich potting soil type soil, rocky, clay and plain "dirt" looking soil. I'm sure that if we had a tool with which to measure the Ph, it would vary from area to area. Messing with the natural Ph can really destroy your soil unless you know what you are doing- Bill did a lot of research on the native plants in the area and how they would each react to the soil change and based the plantings on this information. As I am pretty new to gardening- not to mention planting truffle trees! It was pretty neat to see several hundred pounds of lime up close. As we tore into the plastic bags, a child's sandbox came pouring out of each one. The lime was bright white with specks of grey and very fine. For each hole, (measuring at least 3 feet by 2 feet) we, meaning Bill, Mark, Winsome and myself, stirred the soil back in with the lime, then dug an 8 inch whole and planted a tree. If you want to see one of the trees, I believe Bill is planting one right next to the HerbFarm restaurant.